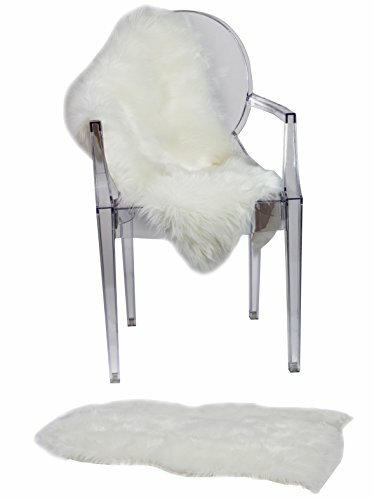 GET THIS MAGNIFICENT SHEEPSKIN RUG & BEAUTIFY YOUR HOUSE! Everybody can benefit from our product. Its amazing material can guarantee endless hours of relaxation on it and coziness during chilly nights! This faux fur rug is ideal to help maintain insulation in your apartment and keep your feet from getting cold. So you and your kids will be totally safe! Due to its magical construction, it bears the quality of keeping you warm in the winter and cool during the summer! Truly amazing, right? Its white soothing color can compliment any room in your house and match any color that your house is painted in. Don't you worry about that. You should worry about where to put this elegant rug and who will be the first to enjoy it today! Place it in the nursery to make it a fine area for your children to play on and roll over. It can be used as a seat cover to make your seating smoother if you happen to have any back pain. Or simply place it in front of your fireplace and cherish moments of happiness with your friends while playing a board game or drinking a glass of wine! Why wasting your money on poorly made products when you can get better quality for less? CUSHIMAX has designed this rug to provide you everything you might need from a rug. It feels like real wool and it is accompanied by Suede fabric as a back lining! Super comfy, ultra soft and truly anti slip effect! Its size is 94cm x 64cm (3ft x 2ft) and will fit perfectly anywhere you decide to place it. You can trim the rug if it is necessary and fold it if you want to carry it somewhere else or take it along on a trip! Easy as that! If you have any questions about this product by RUGLUSH, contact us by completing and submitting the form below. If you are looking for a specif part number, please include it with your message.